Magic 2015 Duels of the Planeswalkers was announced for release this summer on Xbox One, Xbox Live Arcade, Steam, and mobile devices. While not a surprise considering they've produced a new game every summer for the past 5 years, what is interesting is that for the first time DoTP is introducing completely customizable decks. You can now customize anything in your deck, making this year's DoTP closer to real life Magic dueling than any previous installment. 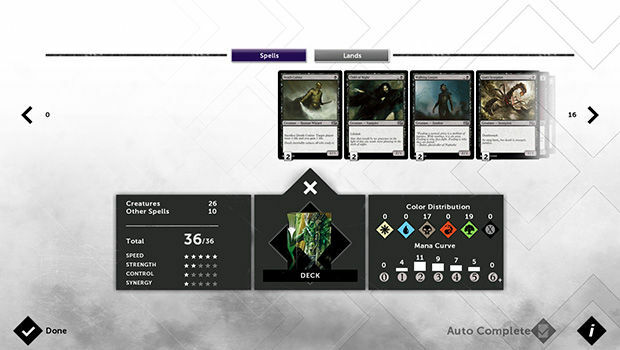 The deck building tool allows players to create their own decks out of any cards available in the game (2015 core set) and sort by cost, mana type, and rarity. For newbies or lazy folks like myself the tool can also auto-complete any deck, even with just one card. This time around you're trying to put a stop to Garruk who has gone mad with power, now choosing to hunt Planeswalkers instead of forest beasts. No longer do players have to wade through the tutorial and missions to unlock the deck of their choosing -- everyone gets to choose their starting colors up front. When missions are completed, booster packs containing a semi-random assortment of cards are given as a reward. Gameplay is extremely similar to past titles, although I noticed that it was a tad smoother and also much easier to read stats (life, number of cards in graveyard, etc). However, without the automatic deck balancing of past titles I'm curious to see how everyone fares with their customized decks and if this installment will turn more casual players away.